In this 3 hour workshop with Moon Yoga Nico you will learn the fundamental knowledge of tarot reading. 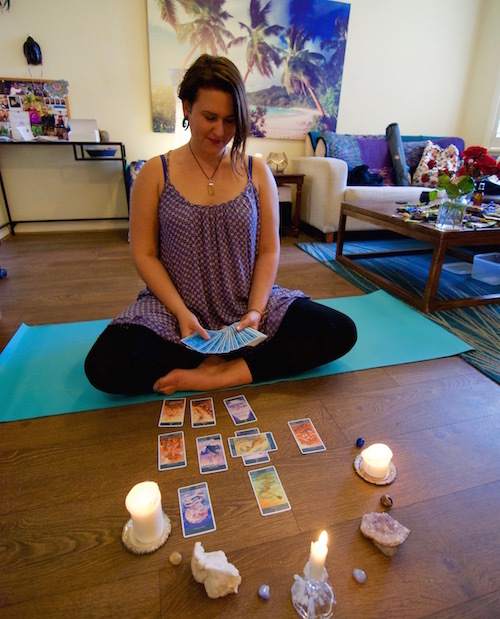 Throughout this 3 hour tarot workshop, participants will learn a brief history of divination, along with how to choose a deck, treat a deck, read energy, connect to the higher self as well as how to read the cards. We will practice tarot readings in pairs and also discuss symbols, astrology and numerology associated with the cards. You will leave this workshop with the traditional Rider Waite tarot deck, and a booklet written by Moon Yoga Nico with key tips and tricks to performing tarot readings. Nico offers clairvoyant tarot readings, intuitive counselling, and astrological insight. Nico was gifted her mum’s old tarot deck at age 10, and was later told by a trusted, psychic-medium that she would have a gift. Since then she has performed hundreds of readings and has given much insight and inspiration during times of need.